Criminalization of food may cause cows everywhere to have to go underground! “Michael Schmidt, farmer and real food activist, is a man to be admired. Since 1994, Schmidt’s been persecuted by the Ontario government. His crime? Producing and selling milk and cheese that is not pasteurized. In Ontario – as in the rest of Canada, it is illegal to produce, sell or distribute raw milk or cream. It is however, legal for farmers and their families to consume these products, and that does not make much sense to me. There are many other things that don’t make sense to me. I am becoming increasingly concerned that the government has the power to criminalize the production of healthy food. Whether it be banning backyard hen, trying to pass legislation making it illegal to grow herbs and plants that have medicinal properties, or the production, consumption or selling of raw dairy, the government is going too far. These recent legislative trends lead me to believe that lobbyists for the pharmaceutical companies and agri-food businesses remain ever powerful. Their campaign donations, gifts and kickbacks are far more valuable to politicians and policy-makers than your human rights. I think we can all agree we should have the right to produce and choose our own food. It scares me that the government can ban the production and sale of something as innocent as raw milk. Alcohol, cigarettes, and processed foods – all proven killers remain legal and freely available. People should have the right to make up their own minds regarding what they consume. We as consumers should have the right to decide what we put into our bodies. I have had the opportunity to consume raw milk and dairy products. Not only was I impressed with improved taste, but I never felt healthier! I will barely touch pasteurized milk, and if you ever get a chance to have a glass of real, raw milk, you will come to realize why all on your own. People who choose to consume raw milk have typically done their research. These are educated consumers. They know the arguments against drinking unpasteurized milk. They choose to do so because they believe in and have experienced the health benefits of raw milk first hand. Read it all on The Happy Homesteader. Media plus neighbours shouting at the government. Poor cow ! 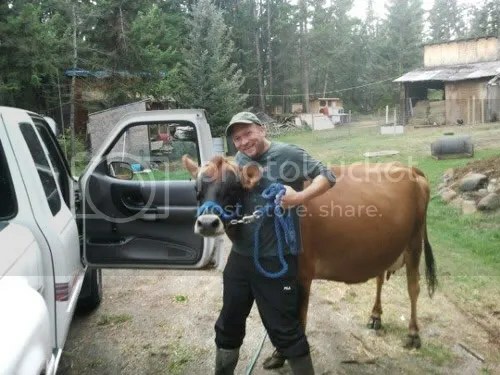 Yes the cow has to go back to the farm at night. Expensive lawn mowing. BC government passed a transitional “health regulation” , two years ago, deeming raw milk a poison worse than turpentine , what makes you think the government would not pull a similar stunt and stamp out even this remaining loophole ? Apparently and unfortunately there are indeed a lot of highly paid politicians, bureaucrats and government lawyers with tons of spare time on their hands to do nothing better than petulant things like that when nobody is looking ! If the drug companies can sell their dangerous products on T.V. and make us believe that the world and our health will forever be good, with only a few side efects like pain, dizziness, upset stomach, diarrhera, constipation, dry mouth, on the rare occasion death and a whole lot of other ailments that would make you feel that what ever you had wasn’t that bad. We should do the same thing with raw milk or even coconut oil for that matter which is good for you contrary to peoples beliefs. Tell people on T.V. what’s good for them. If they see it in this way I believe things will start to change and people will start to voice themselves to their elected officials.